Royal Plumbing carries Rinnai tankless water heaters at our shop in Redding, California. Having one of our plumbing professionals install a new tankless water heater will be one of the best, most cost-effective plumbing decisions you ever make. To learn more about tankless heaters or to speak directly with a plumbing professional, please contact a plumber at our Redding shop by visiting our contact page. Tankless water heaters produce more hot water using less energy than the most efficient storage tank style heater. Tankless is the environmentally responsible water heating solution. It saves energy, saves space and saves you money. Rinnai tankless water heaters heat the water you need, when you need it, turning any water source into hot water on demand. You are not limited to the amount a storage tank heater can hold. Whether you are washing the dishes, washing your clothes, or drawing a hot bath, Rinnai’s tankless water heater technology will supply endless hot water to your lifestyle demands-even if you do them all at once! Rinnai tankless heaters cost less. 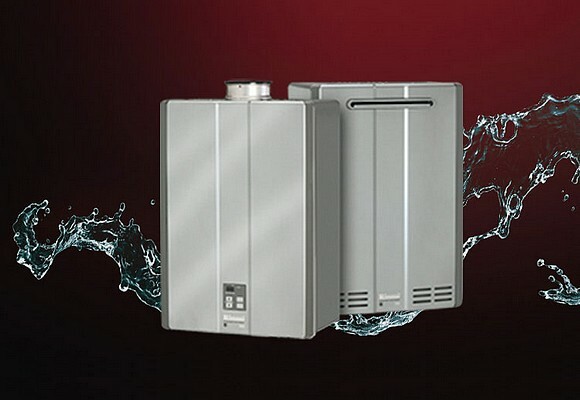 Enjoy up to 40% energy savings with a Rinnai tankless water heater. Our units are designed to be highly efficient and only heat water when it is needed, a revolutionary advantage over inefficient tank-style heaters. Traditional vs Tankless: Traditional tank water heaters can take up to 16 square feet of valuable floor space. However, Rinnai tankless water heaters are about the size of a carry-on suitcase and can be installed on virtually any wall inside or outside of your home. Traditional tank-style water heaters can build up rust and scale inside their tank, where the hot water you use for bathing and drinking is stored. With Rinnai tankless water heaters, you will always experience fresh, clean water that is heated on demand as it passes through the unit. Energy Star: Rinnai has earned ENERGY STAR approval by meeting the strict energy efficiency guidelines set by the U.S. Environmental Protection Agency and the Department of Energy, by using less energy and preventing greenhouse gas emissions.